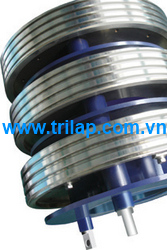 Agent of Morgan Hong Kong in VN (TriLAP Carbon & Graphite) can supply slip rings and commutators for industrial and traction applications. Slip Rings whether built up or molded, Morgan supply both, as well as the brush holders and carbon brushes to suit, we also offer repairs and refurbishment. Produced in a wide range of sizes and designs for both power and signal transmission.